Even with our cool, wet spring and cool, wet early summer my tomatoes are coming on full steam. I pick some everyday now and somehow having fresh tomatoes on the counter makes dinner easy. They are so long-awaited, so sweet and beautiful and liven up practically any ingredient or comfortably take the main stage. And speaking of the tomato bounty and the pepper, eggplant, and corn bounty that’s upon us, I have two classes scheduled in late September that will take full advantage of these fleeting pleasures. 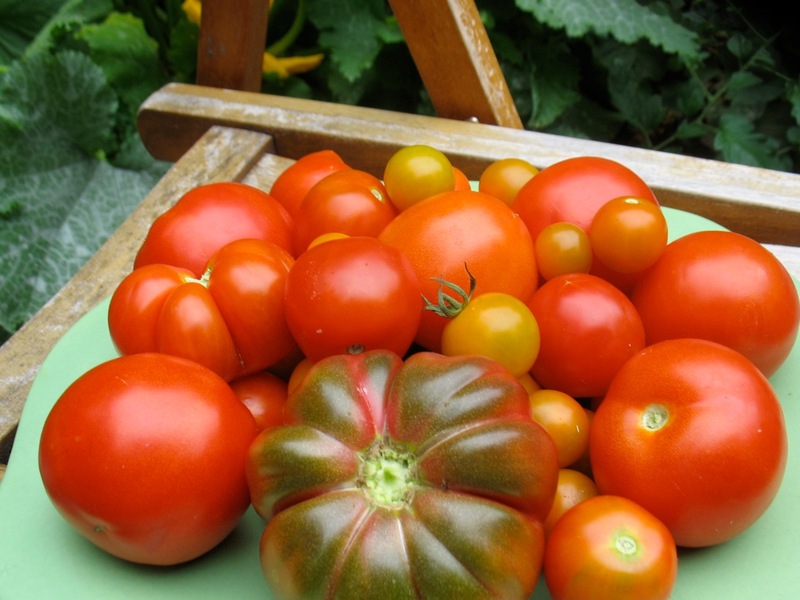 The first Black Krim, some Early Girls, Stupice, and Sungolds–this morning's harvest. But back to today’s tomatoes . . . for lunch they make their way into sandwiches with a fried egg or just basil and sharp cheddar or a BLT if I really have it together. For dinner they get diced and tossed with feta and basil and maybe cucumber and lots of basil. This is a standard Italian dish. 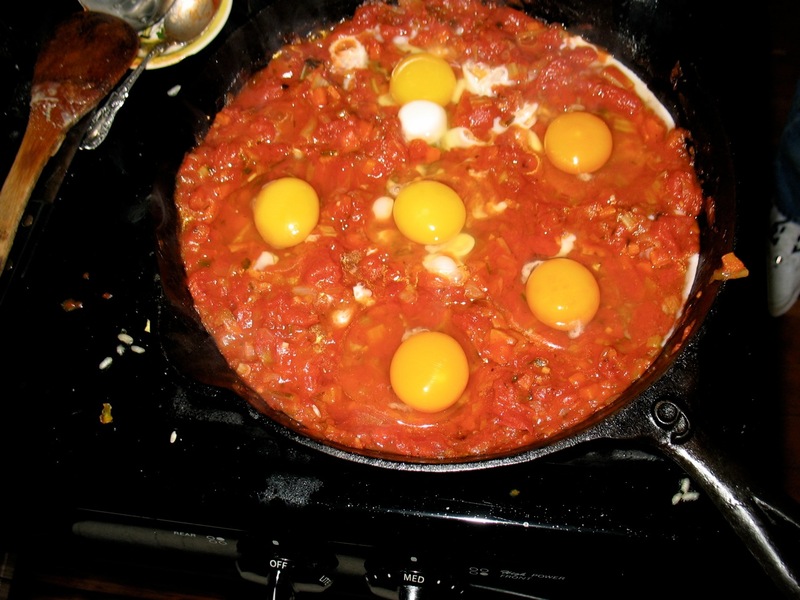 If you have pre-made tomato sauce it takes mere minutes and if you have fresh tomatoes it doesn't take much longer to put together a quick sauce. Top the eggs with some grated parmesan towards the end for a fancier dish and be sure to have some good bread on hand to serve with this. 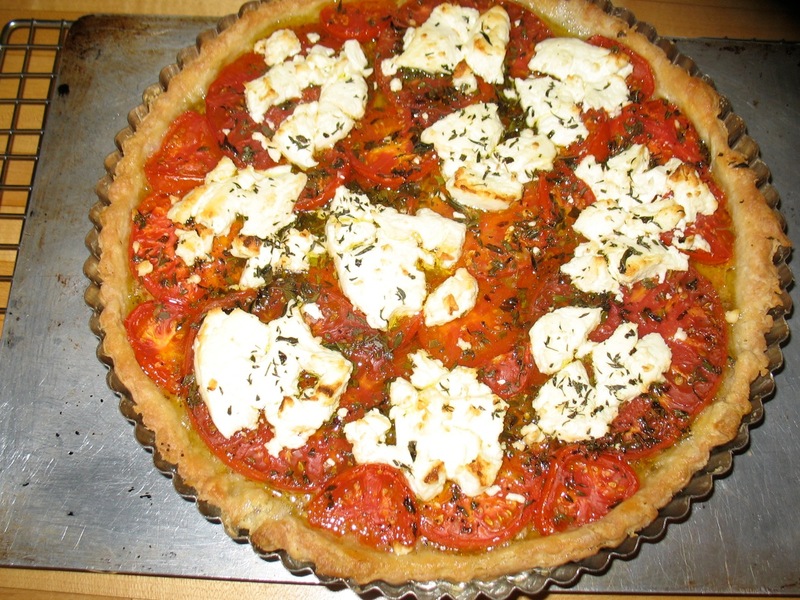 If you have a little more time, I urge you to make this wonderful tart with tomatoes and goat cheese I started making last year after seeing it on David Lebovitz’s blog. It’s actually quite simple even though it does involve a crust. And finally, if you need a picnic dish (though the tart is great for that too) and have some garbanzo beans (or white beans would probably be good too) on hand, toss them with diced tomatoes, some cucumber, maybe some arugula and/or basil and some sweet onions. Crumble some feta and dress with a vinegary dressing and you’ve got a wonderful refreshing and hearty salad. 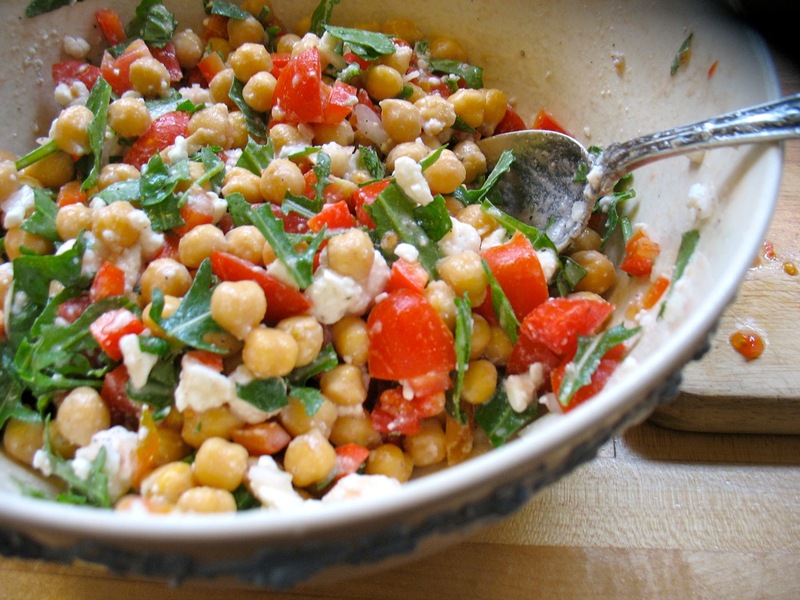 Quick Garbanzo Bean and Tomato Salad. This dish was inspired by the ever clever and creative Heidi Swanson from her book Super Natural Every Day. 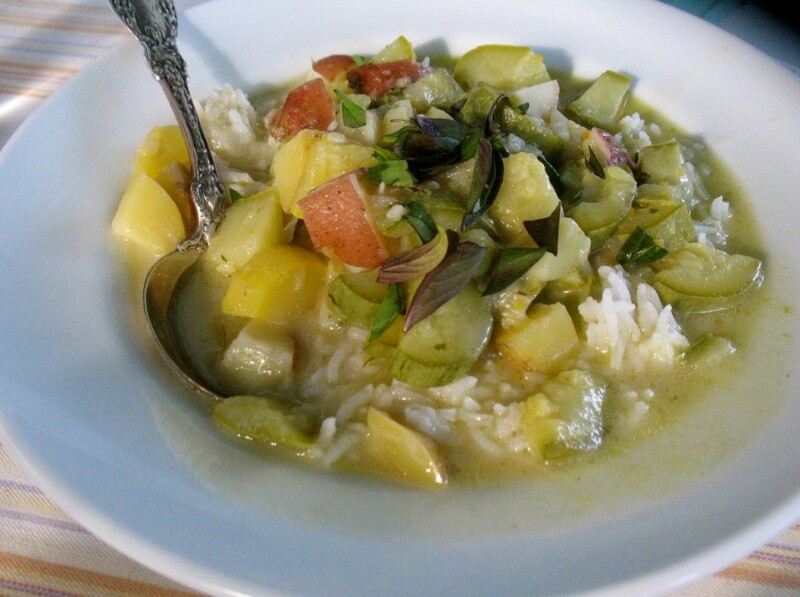 This recipe uses a good number of summer squash so it’s a great way to work through a stash. It’s wonderful warmed up the next day for lunch either eaten as soup or over rice. I can imagine this being delicious with other veggies as well as the season changes so experiment as you see fit. It would also be delicious with some chicken or prawns if you want to dress it up a bit and make it heartier. Put a large soup pot on medium high heat. Add 3-4 tablespoons of the solid part of the coconut milk that makes up about the top fourth of the can, to the hot pan. Add the 1-2 teaspoons (depending on how much heat you want) of green curry paste and mash it up with the back of a spoon and blend it into the coconut milk. Fry this mixture for a couple of minutes until it becomes fragrant. Add the sliced onion and fry for a few minutes until it softens. Add the squash and potatoes, several generous pinches of salt and cook, stirring often for 3-4 minutes. Then add the garlic, the remainder of the coconut milk and the broth. Bring to a boil, then turn down and simmer for about 10 minutes until the vegetables are tender. Add most of the basil (reserving some for a garnish) and cook for another minute or two. Adjust seasoning and add a squeeze of lime juice, if using. Serve hot over rice and garnished with more basil. Green beans (Kentucky Blue) from my garden. I have a small garden with only a few places with really good, sunny exposure. 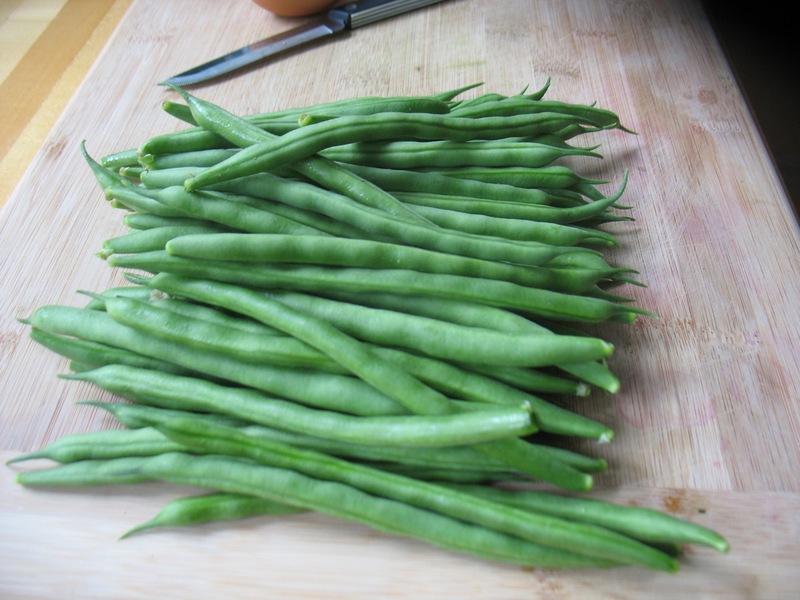 I sow green pole beans every spring in one of those sunny places and every year I’m taken aback by how delicious they are. Once they start producing I pick them twice a day–first thing in the morning and just before it’s too dark to see. I only have about seven plants that have wound their way up their strings along my fence but I managed to pick about a pound over a four-day period. 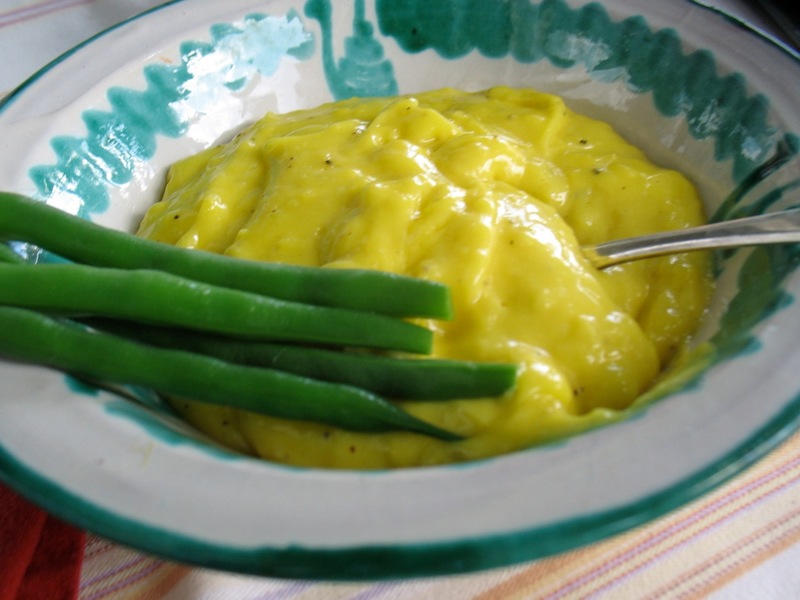 My favorite thing to do with these tender things is to make aioli (garlicky mayonnaise) and dip the perfectly cooked beans (by which I mean four minutes in salty, rapidly bowling water) into the aioli. I recently ate three-quarters of a pound of beans in a single sitting. My boys got a few but they don’t rhapsodize about them quite like I do so everyone was happy. I know I’ve written about aioli here before but here are some photos to go with it. 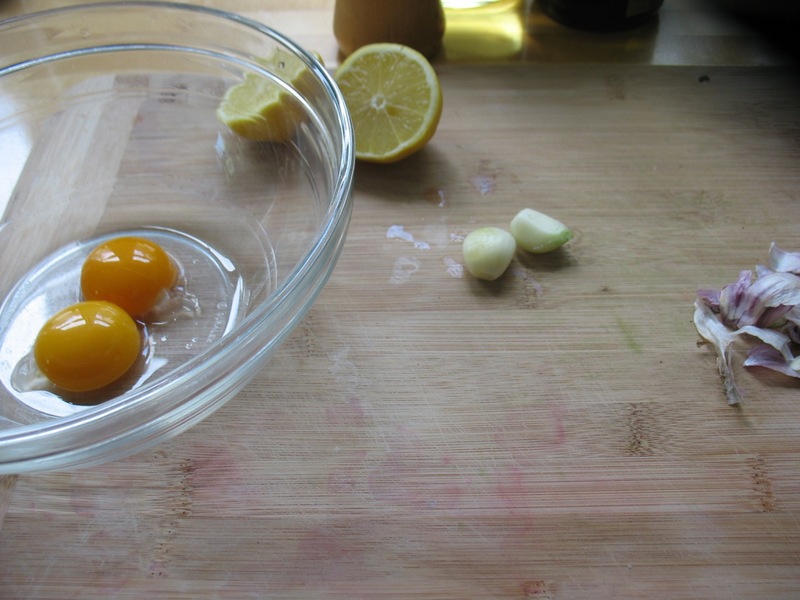 2 beautiful yolks, 2 cloves of garlic (much less than is traditional but I like a slightly milder aioli), and fresh lemon juice–the foundation for aioli. You can use a mortar and pestle to mash the garlic with some coarse salt (gives it the texture you need to mash it well) or just do it on a cutting board with the side of a chef’s knife as I’ve done here. Just chop the garlic cloves first, sprinkle generously with coarse salt and then lay the side of the knife on top of the garlic, push down and pull the knife (dull side) toward you. Repeat until you have a nice paste. It takes a little practice but once you have it down it’s a quick way to get a good, homogenous paste. 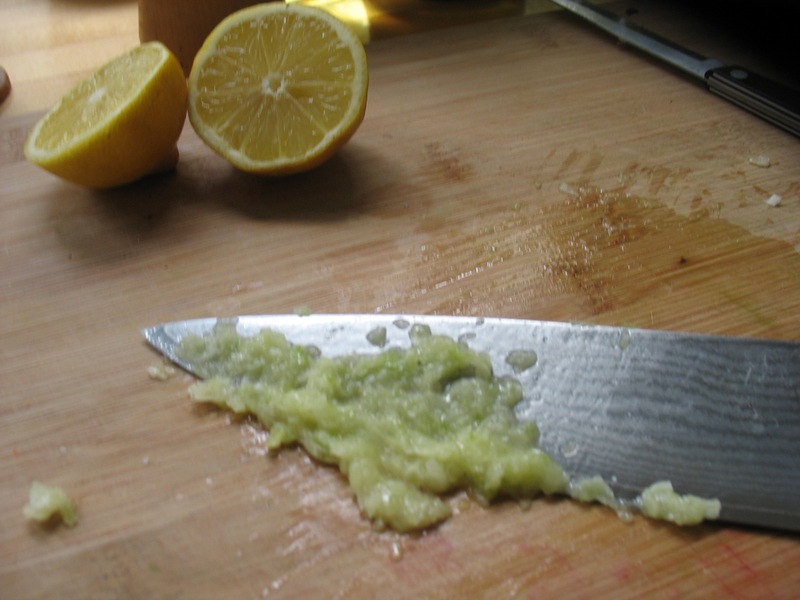 Mash garlic to a paste with salt (either in mortar and pestle or with a knife –see note above). Put garlic in a medium-sized bowl. 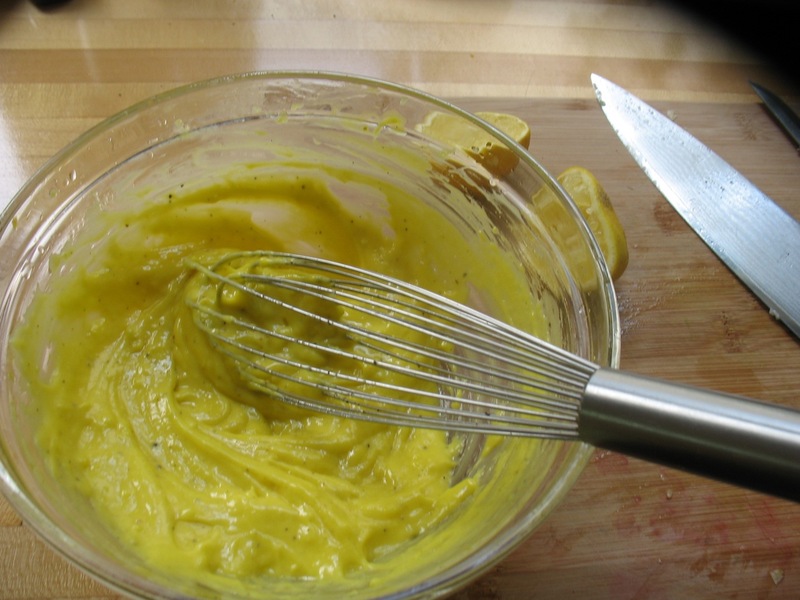 Add the egg yolks and 2-3 teaspoons of lemon juice and some black pepper. Whisk well. Then start adding the olive oil drip by drip or in a very thin stream at first. You’ll need to incorporate about 1/4 cup of oil like this before you can safely speed things up. This is the most important step in ensuring that it properly emulsifies and doesn’t break. Incorporate the rest of the olive oil and neutral tasting oil (it can get too bitter if you use just olive oil, though this is a non-traditional approach but one I like) and adjust seasoning with more lemon and/or salt. 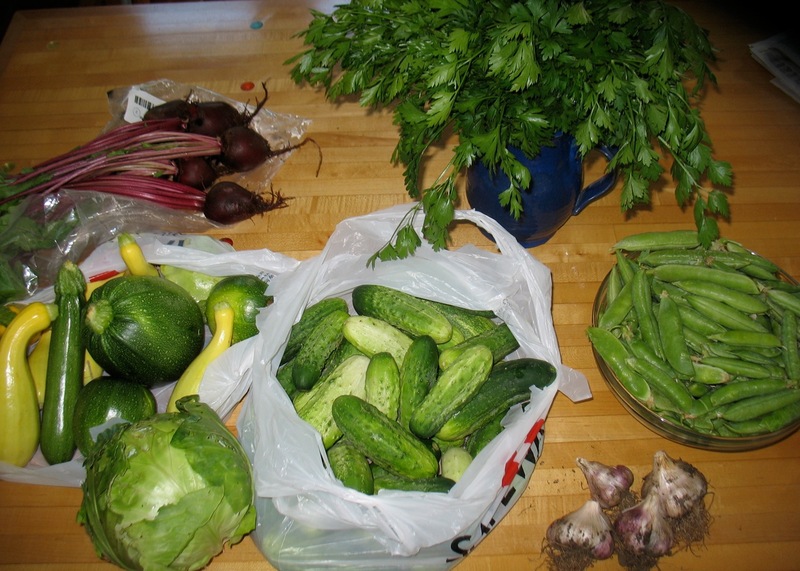 The "granny CSA" or what I brought home from my mother's this weekend. It’s not that I have SO little time to cook it’s that I am preserving or u-picking or really want to be outside while the sunshine lasts. It’s the time of year where I get almost overwhelmed with the beauty and bounty of the produce and get a little panicky that I won’t be able to take full advantage of all of it. And tomatoes, corn, peppers and eggplants haven’t even really hit here so what am I going to do next week, the week after?! It’s a luxury problem and I am grateful for the bounty. And I am grateful for my mother who grows so much of it. 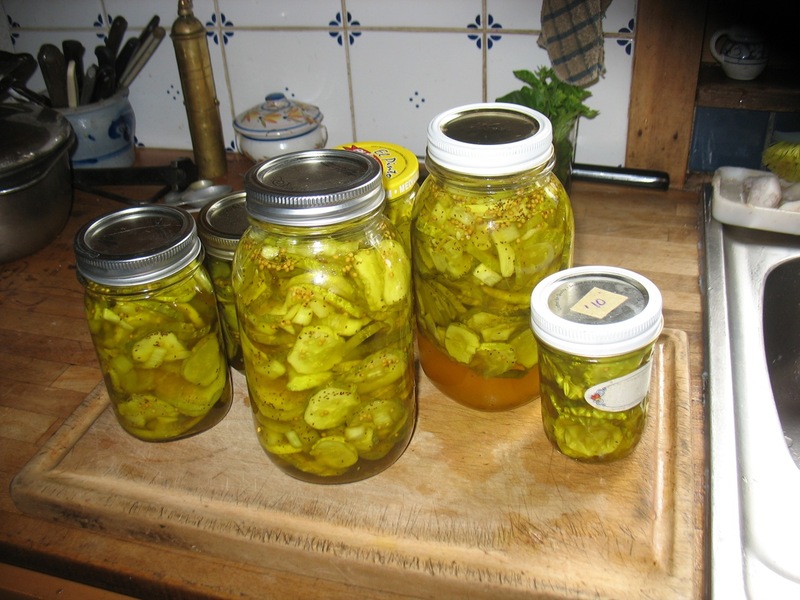 We spent less than 24 hours at my mother’s this weekend principally so my husband could make pickles with my mother. My husband is not a pickle fan but loves her bread & butter pickles from the Joy of Cooking she’s been making for 30 years (here’s a similar recipe). Brian's second batch of bread and butter pickles. The top photo shows only some of the loot I brought home. Not shown are three quarts of Marion Berries that I turned into Marion Berry, peach, vanilla jam (instead of planning my fall classes which I am determined to do this week!). 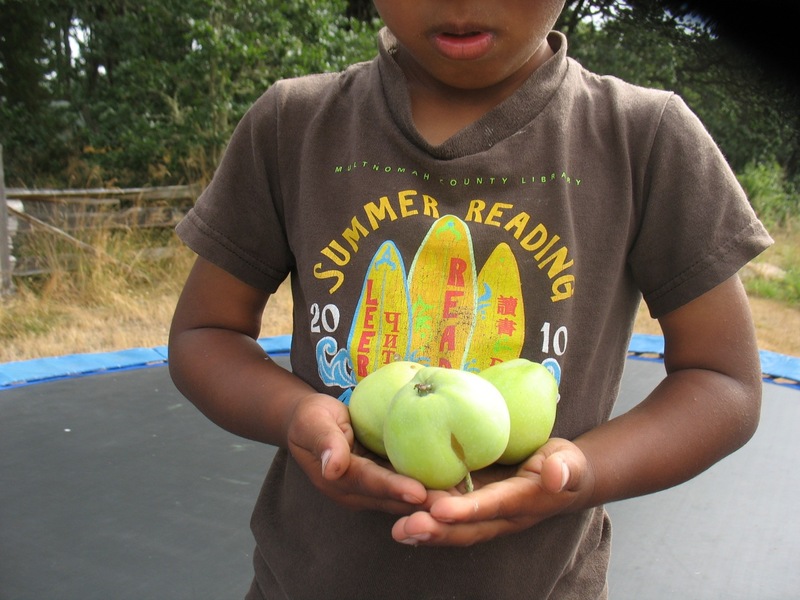 And the first of the Transparent apples are ripening here in the Willamette Valley and my son ate all three of those little things plus a lemon cucumber, which “one can eat like an apple but it doesn’t even have a core!” he gleefully discovered. First, rather tart Transparent apples of the season. 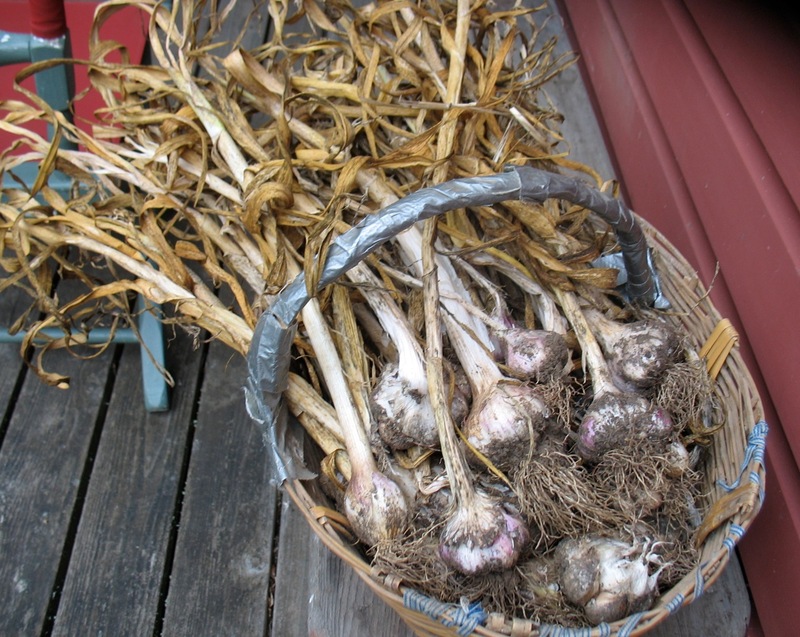 And here’s all the garlic she grew this year. And take note of the basket it’s in. The handle is completely duct-taped and the rim is reinforced with some ribbon. These are the kind of things that drove me crazy as a teenager. My parents hung onto everything. . . product-life-extension, as my older brother calls it. Now it doesn’t drive me crazy. Now I realize just how spot-on her priorities are. Grow the garlic, forget about a new basket. Who has time for that? P.S. With the beets (from the Granny CSA) I made this. I’ll be making this with the parsley, and I made a wine-braised cabbage dish with the green cabbage that was quite good: 1 cup of leftover cheap rose (would be better with a dry white wine I think); some finely chopped rosemary, 1/2 an onion, 1 tomato, diced, and salt and pepper. 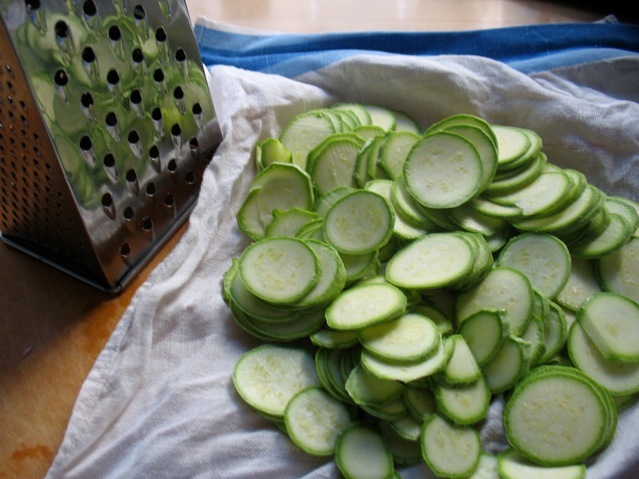 Thinly sliced zucchini rounds cook really quickly on a pizza and make for a surprisingly delicious topping. And if you have good pizza dough, the topping is practically an afterthought. Almost anything tastes good on a yeasted dough that’s baked on a stone in a hot, hot oven. I set my very basic, non-commercial gas oven to 500 (as high as it goes) and preheat it with the pizza stone in it for 30 minutes or so and then slide the dough with whatever topping I’ve thrown together onto the stone. 15- 20 minutes later dinner is done. 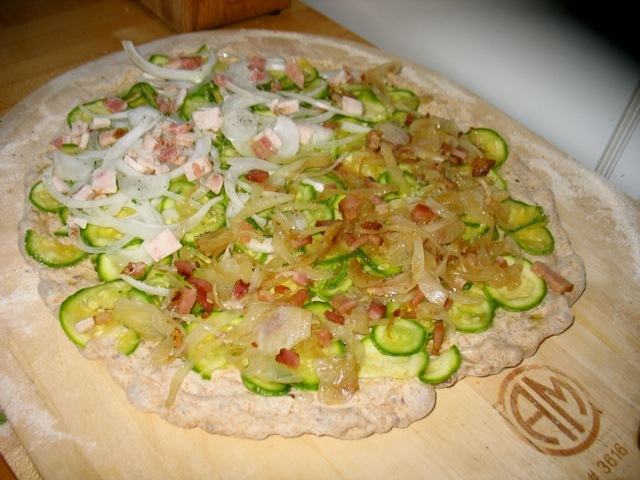 Last night I found a few zucchini in the fridge, half a Walla Walla Sweet, and a bit of bacon. I thinly sliced the squash and sprinkled salt on them and let them sit on a dish towel for 10 minutes to soften up while I prepped the rest of the ingredients. 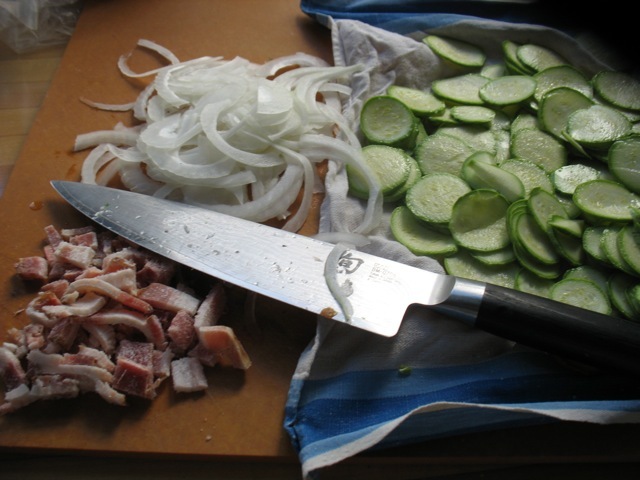 Since my husband is not fond of raw onions and I wasn’t sure just how soft the onions would get in the 15 minutes in the oven I decided to saute half the onions and bacon for just a few minutes to take the edge off. Pizza about to go in the oven; half with raw onions and bacon and half with briefly sauteed onions and bacon. 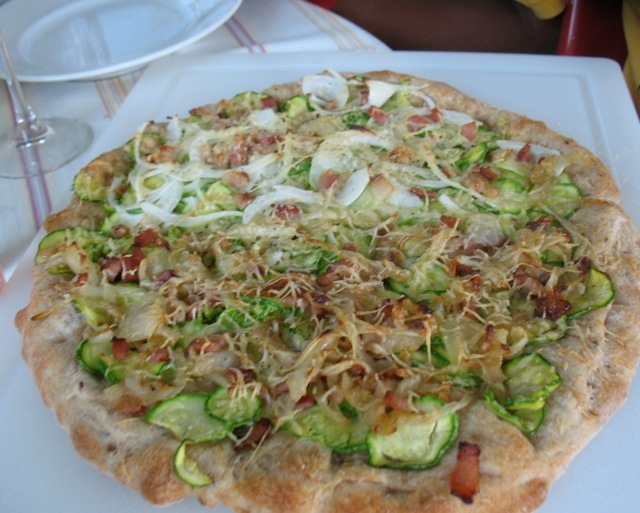 I squeezed some liquid out of the zucchini slices and then brushed the dough (that was incredibly easy to stretch and shape) with olive oil, sprinkled it with salt and then scattered on the squash, onions, bacon and just a little grated parmesan. I had generously floured the pizza peel (don’t forget this step) and slid the whole thing with a quick jerk of the wrist onto the hot stone. I loved both sides of the pizza as did my husband and son (though he insisted on scraping the topping off and eating it separately). The sauteed side was a bit sweeter but the Walla Walla’s are so tender and mild and kept their shape a bit better lending more texture to that side. So, a toss up, really! Chances are whatever you have in your garden or from the market will make a good pizza topping. And if you don’t want to use meat here I would add a generous sprinkling of fresh basil and/or oregano and a bit more cheese (maybe feta too). Generally my pizza advice is go light on the topping (with or without sauce), be generous with herbs and spices and most importantly, make pizza often this summer. P.S. New summer and fall Cook-with-what-I-have Improv Classes posted. Pizza dough freezes beautifully. So if you’re only going to use half of it or want to make a double batch and save some for future use, just lightly oil a 1 qt freezer bag and put ½ a recipe worth of pizza dough in. Thaw it thoroughly and bring it to room temperature before using. Then handle exactly the same as fresh dough. In Jim Lahey’s original recipe he has you bake the pizzas on a sheet pan. I do that sometimes, especially for his potato pizza because there’s so much topping, but usually I bake them right on a pizza stone which makes them wonderfully crisp. If you’re using a pizza stone you don’t need any oil and just place the stretched out piece of dough onto a well-floured pizza peel (or the back of a cookie sheet if you don’t have a peel) and after you’ve added the toppings you slide it right onto the hot stone. I have tried this recipe with half whole wheat flour and half white. It turns out fine but is a bit of a different animal—not as crisp a bit nuttier and chewier—as you might expect. In a medium bowl, stir together the bread flour, yeast, salt and sugar. Add the water and, using a wooden spoon or your hand, mix until blended, at least 30 seconds. The dough should be able to contain all of the flour, if it seems dry or if there is excess flour at the bottom of the bowl, add water a tablespoon at a time. Cover the bowl with a tea towel and let sit at room temperature until the dough has doubled in volume, about 2-3 hours.